Social Media, Blogging, Design and more. Get the latest STM news delivered to your inbox! BlogHer Conferences, Where do the opportunities lie? I can’t help but look back, with two BlogHer Conferences under my belt, and wonder about the opportunities past, present and future. Hushed talk of swag-a-holics and those only interested in attending to “connect with brands” take place across twitter, blogs, facebook groups and more. I personally was blown away to learn that some who attend BlogHer do not actually show up to or plan on attending any conference sponsored parties, sessions or events. To me this makes no sense at all. I feel that if bloggers are truly interested in connecting with brands and working with them in the future, why are they looking everywhere but at their fellow bloggers? Do they not recognize that many of the women in attendance do represent brands, some even own their own brands, even though they’re not throwing a private party or hosting a booth at the expo hall? I got an overwhelming feeling when visiting the brands at the Expo Hall this year, I felt they were exhausted, overstimulated and had that “Oh god, I don’t care if I ever see another female blogger in my life” look on their face. To me, not the best scenario to walk into when trying to make a lasting impression. After all, are the folks at the booths and at private parties actually in the position to make a connection with you? I think not. Even if Joe Schmoe at XYZ booth was the CEO of that company, what sort of connection do you stand a chance of making when you’re the 3,426th woman to give him your card and make pleasantries? I don’t think many have any hope at making an impression. You might be wondering, why would they be sponsoring then, if they’re not interested in making connections? Well, they’re sponsoring because in giving you free stuff, you’re likely to give a tweet or two about them, perhaps include them in a video response or blog post and multiplied by 2-3-4,000 bloggers, they’ve got a chance at getting some pretty great promotion by being a sponsor/vendor. Real connections? These I feel were overlooked by many. Real opportunities? These were the women sitting alone at lunch or breakfast, chatting with a few at a party or sitting next to you at a session. Sure, you might have thought that you’re not there to make friends, but in attempting to make connections with even the most unassuming person there, you stand the chance at becoming that brands next ambassador, obtaining a future review/giveaway, making an impression, and building a reputation for yourself. There are many types of blogs, many BlogHer intentions and many goals. Free coupons, t-shirts, toys, makeup and re-usuable shopping bags…sure those are fun. But long term, will you be remembered by those who placed those items in your hand? Was it even their goal TO remember you? Top 10 BlogHer Newbie Observations, the short list! Woah mamas! What a rush the last four days have been! I’m on a plane now and on my way home from my first BlogHer. Many more detailed BlogHer posts to come but for now I thought I’d do a quick re-cap on my newbie BlogHer observations. It’s really not that fancy. I stressed to no end over what I would wear and was pleasantly surprised to find most of the women were dressed really casual, even at the parties. Jeans and a comfy shirt, flats or flip flops and you’re good to go. Just be yourself! Socializing is hard work! For someone who is social day in and day out online, there’s absolutely no comparison to socializing in real life, face-to-face. It was hard, not everyone is cut out for that aspect of the trip. Swag! Yes, there was free stuff. I have a whole suitcase full and that was with very minimal effort and no special swag parties. I can not imagine the amount that some must have had to take home and the cost to ship it. Food! Although the cost of the trip can be overwhelming, the free food; breakfast, lunch dinner, snacks, beverages and alcohol was free! That really does save you a ton when it comes to budgeting for your trip. Roommates! One is good, you’ll have a buddy. More than that and I think you’d be sorry. Because the trip is so exhausting it is nice to have a quiet room to go back to and unwind, the more roommates you have the less time you’ll have for sleeping and R & R.
Private Parties? I found out when I was there that the private parties were set up in advance and invites/rsvp’s were obtained prior to the event. Look for tweets about various private events if you’re interested and then email people for details. Looked to me like there would be a lot of work involved in scoping them all out. May not be worth it to everyone. I don’t feel like I missed anything important by not attending any. Have fun and don’t be afraid to go it alone! The women attending BlogHer are super friendly and there are a ton of people to talk to and a lot of people who are also going solo. You won’t have a problem walking up and making conversation and if you don’t someone is sure to approach you. Well that’s my quick take on suggestions for newbies based upon what I just experienced. BlogHer’12 will be in New York City next year so start planning now if this is something you think you’d like to attend. Make it happen just like I did! Wordless Wednesday: My BlogHer’11 Artwork! BlogHer Obsessed Part 2: The #HauteGreen Social Hour and just about a week away from fulfilling a dream! It might sound like I’m sensationalizing BlogHer, making it out to be a bigger deal than it really should be but I assure you, it’s a HUGE deal to me. When I was a cloth diaper retailer the big deal was to go to the ABC show. Fellow retailers would meet up, check out the latest and greatest products, take photos posing with eachother and it looked so fun. The other thing they did was shop. I suppose when you don’t have the funds to back up the ABC shopping spree the trip might not seem as worth it. Taking the trip, in my opinion, separated the big guys from the little guys and I wasn’t sure I’d ever be able to go. With BlogHer I feel a certain sort of accomplishment, a step towards taking She Thinks Media to the next level. I do realize or am realizing that anyone and everyone can go to BlogHer and it has a lot to do with networking and getting free “swag” but I for one hope to actually get to learn some things, in fact I am determined to. My next goal, and yes I am already thinking about my next trip to BlogHer, is to be able to buy someone else a ticket and make their dream of attending BlogHer come true. So, yes I am technically a week away from fulfilling a dream, and I am super excited. Although just last night I picked my mom up from the airport only to find that they’d lost her luggage along with about ten other people on her flight. “Oh, it’s still back in Charlotte” the airline’s desk attendant said casually. Visions of arriving in San Diego only to find that I had nothing to wear flashed before my eyes. I suppose maybe it’s a good thing, to be safe than sorry, and because of this I will attempt to carry the bulk of my important clothing in my carry on. HauteGreen? What’s that you might wonder? Well Haute Green Social Hour is primarily being coordinated by Calley, The Eco Chic, a fellow green and cloth diapering blogger and social media guru. It’s being co-hosted by myself and a few other cloth diaper addicts. We’ll be meeting Thursday afternoon before BlogHer at a local sushi restaurant and we’ve invited over 50 other green minded mommy bloggers. Oh and Calley would like me to tell you why I think I’m a #HauteGreen mama. Ummm, well the definition of haute is high class. So I suppose I am not really “haute” but I hope that some of my readers and fans find my blogs and the work that I do for my clients professional and classy. As for the green part, I feel I represent well a growing number of mamas who are greener than most but are also modern. I’m no hippie, well maybe a little, but I don’t dress like one. Today there’s a whole spectrum of green families and I just love being a shade of green and meeting others with the same values. Being green is not an all or nothing lifestyle and I am certainly an eclectic mix. Phew, so enough about my BlogHer obsession. I could go on for days, and I am sure I’ll find another BlogHer post in me somewhere before the trip. I’m seriously losing sleep at night people. BlogHer is literally on my mind 24/7. I haven’t flown on a plane since before 9-11 and haven’t left my husband and kids for more than one night, which was spent in a local hotel hanging with my SIL’s. To be perfectly honest, I’ve never hailed a taxi on my own, slept in a hotel room on my own, eaten in a restaurant on my own…Is this normal? Oh and the big thing…I’ve never been to BlogHer! So for this trip there will be a lot of firsts for me and I am as excited as just about any one adult could possibly be! BlogHer was just a dream. For years I watched BlogHer conferences come and go, I admired those who could make it, but I never let myself even explore whether or not it was a possibility for me. So what changed that? Well around the beginning of this year my husband went to a Fire Conference with a few of his firefighter buddies (co-workers), they stayed in a hotel, attended training sessions during the day. The trip was paid for my his department. I thought about how cool it would be for me to attend BlogHer, if I could get sponsors, and so I brought it up to my husband, pretty much assuming he’d say it was just out of our reach, maybe some other time, etc. To my delight, despite the fact that it was all the way across the country, on a plane, away from home, would cost hundreds of dollars AND he’d have to watch our three kids for four days…he said “go for it!” I was left wondering why I hadn’t dared dream or discuss BlogHer outloud before? I think I was afraid to get my hopes up only to find out that we could not afford the trip. Things began to fall into place, I got my BlogHer ticket, thanks to an online buddy (The Eco Chic) who pointed out that they were on sale for ONE more day! I felt like getting my ticket was committing, no going back, setting the wheels in motion for my dream to come true and accomplishing my goal of attending BlogHer. Next step, sponsors. Since I am a BlogHer newbie I didn’t feel like I should be agreeing to represent companies at BlogHer because I had no idea what to expect, what was kosher, and I didn’t want to not be able to provide what I agreed to providing. I agreed to do for sponsors what I do best; blog for them and about them, tweet about them, advertise them on my blog and facebook, and give them a sampling of what it is that I do as the Cloth Diaper Geek and She Thinks Media. My sponsor packages are pretty much, a very cheap, sampling of what it’s like to hire a marketing rep for your small business. Rather than to write a novel this morning I’ll try to come back and write a second part about BlogHer obsessed ramblings! Are you obsessed? Been blogging about it? I’d love to read your BlogHer thoughts and advice! Business Cards for #BlogHer’11 are on their way! Countdown to BlogHer’11: My to-do list, roommate and thoughts on leaving my family. Thanks to Calley, the Eco-Chic, for pressuring me…ahem…encouraging me to write a to-do list. 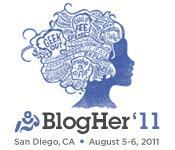 BlogHer ’11 is fast approaching and I am a little scared, a little nervous and a LOT excited! I haven’t flown on a plane since before 9-11 and that alone has me a bit freaked out. Oh and I’ve never left my kids or husband before for more than a night…let alone to go across the country! One exciting tidbit is this, my roommate at BlogHer will be….Kim of Dirty Diaper Laundry! I’m looking forward to getting to know Kim a little better. Advocacy! Get my super cute advocacy buttons that I’ve custom ordered from FunkyLindsay on Etsy! She makes the cutest buttons and I’ve ordered a ton of them to take with me and hand out! Maybe if there are some left then I’ll give them away on my blog after BlogHer! There will be Knickernappies buttons, Cloth Diaper Geek Buttons and more! Shop for clothes! Yes I work at home, this means I wear the same pair of jeans virtually every day, and a couple random tank tops, and flip flops…So. I definitely need to beef up my wardrobe and quick. However, I am cheap and always on a budget, but that’s ok because I love shopping at Thrift Stores. So between now and then I need to get some new, err…new-to-me clothes. Order business cards! I’ve been hearing a lot about zazzle.com, or if you all have any good, quick and inexpensive places were I can order last minute business cards please let me know! That’s definitely on my to-do list. Print tickets! With all this electronic fanciness I have no paper copies of anything. I need to print plane tickets? Can I do that? Do I do that? It’s been so long that I have no clue. I also need to print my ticket to get in to BlogHer, my Hotel reservations, etc. What do I do with my hair!? About a month ago I went pink, but first I bleached it all out. Now it’s faded pink, I have roots, I need a haircut. I need to decide, do I whether I want to re-do the pink, re-bleach my roots….Ah, the decisions. My elevator pitch? Apparently I need a pitch, a brief description of myself, my job, my blog(s), what I do and why. I am assuming I wouldn’t need this if I wasn’t going to get asked, possibly in front of a room of people…which the thought of makes me break out in a cold sweat. At BlogHer though networking with other bloggers is the name of the game so I better come up with something good, and fast. Map out some Geocaches! Yes, I love Geocaching and truth be told, I don’t have a whole lot of opportunities to geocache out of state and so I am not going to leave San Diego until I find at least one. Geocaching in the different places you visit and on different trips is kind of like taking or leaving a souvenir and a great way to remember all the places you’ve been. Netbook! Check! I got a great deal on an Acer One Aspire, let’s just hope my kids don’t break it before my trip! Personal goals! My personal blogging goals are to be able to continue to grow my FaceBook Fans and Twitter Followers between now and my trip. With the help of my new netbook I hope to continue to blog while on my trip. I’m really looking forward to meeting some fellow cloth diapering and mommy bloggers while at BlogHer and I can’t wait to report back to you all and perhaps turn you all on to some great new blogs and the moms behind them. I know I have to be leaving some things out, not sure what, but so far, my above checklist should serve as an idea of where I’m at and what’s left on my things to accomplish. For the last few years I have longed for the opportunity to go to BlogHer but I never tried or even let myself entertain the idea of it being a possibility. This year I decided I was going to do it and make it happen. I hope it inspires some of you who hope to attend in the future, set your sites and never stop believing that you can make it happen if you really want to. Thanks for reading! Love ya! Ready to sign up for hosting? Use code **STM40** to save 40% off your first order at Stablehost. Shop my daughter’s ETSY store! Copyright © 2019 · She Thinks Media. All rights reserved.